What an interesting idea for your tea, your child’s sweet drink or party. Fill a small bowl with water enough to cover the number of slices of lemon to be colored and add liquid food coloring drop until it is slightly darker than desired color. Remember the color will be mixed with the natural color of the lemon so it ill not be perfect. 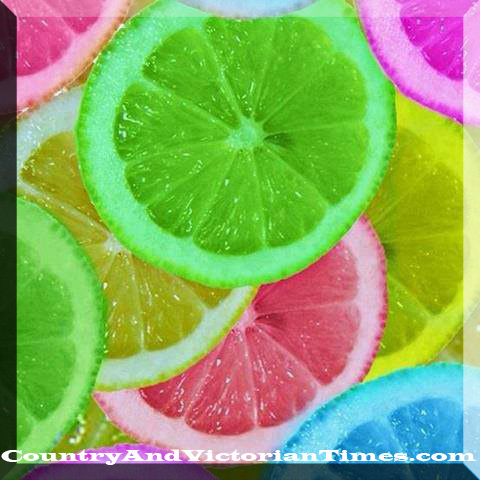 Place lemon slices in the bowl of colored water and make sure each slice goes in individually to ensure proper coloring. Do this for each color you water lemons to be dyed to. You can also use Kool-Aid unsweetened packages to add color in the same way above except to make sure the Kool-Aid is completely diluted first. Use this in punch bowls, tea, Kool-Aid, lemonade etc. This entry was posted in Recipes, ~Drinks, ~Food, ~Party, ~Snack and tagged Color, cook, Food coloring, Kool-Aid, lemon, parties, slice, slices, sugar, tea, water, zest, ~Food, ~Party. Bookmark the permalink.